Attend Samuel Gaines Academy’s Fourth Annual Winter Games on Thursday, February 23rd from 5:30-7:00. Bring your family. The first 100 Colts will receive a goodie bag full of supplies. Play games to win prizes and cheer your Jedi teachers on to win a Pod Party. Mrs. Baptiste’s third grade student, Jayden Fairchild, put her amazing reading skills to work as she read a favorite classic story to Mrs. Auciello’s first graders! The class was silent and fully engaged as they listened to her read to them. Northport Speakers Bureau Shines Forth As Gold! Northport Proud of Young Scientists and Engineers! White City Elementary students enjoyed a dramatic production of Rockin’ Red Riding Hood. 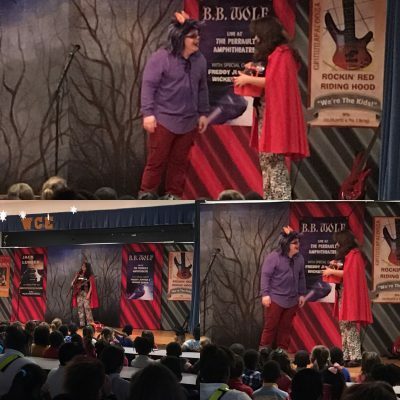 Students made connections between the stage presentation and the traditional story version. Students had a rockin’ good time as they compared point of view, themes, and the pattern of events.